FREE Android Tablet with every 4+ CCTV Installation! With over 25 years in the security business you can trust us to protect your home, family, and business. We set ourselves apart with unwavering integrity and a strict code of ethics. Based in Birstall, West Yorkshire, we cover a large local area including Leeds, Bradford, Harrogate, York, Wakefield, Doncaster, Sheffield and Hull. Great bunch of knowledgeable lads who know what products are suitable for each application. I've used them at both my home and business with no problems. I would definitely recommend to anyone looking for a good reliable security company and will be using them again as we look to expand. 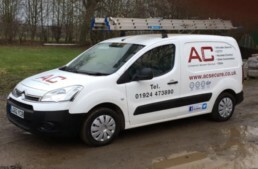 AC Secure have done a number of jobs for us, and have always been very professional and reliable. We would have no problem with recommending them to anyone.